2006/12/12 18:37:00 - Facilitating, err, payments? Today at work I got this letter. 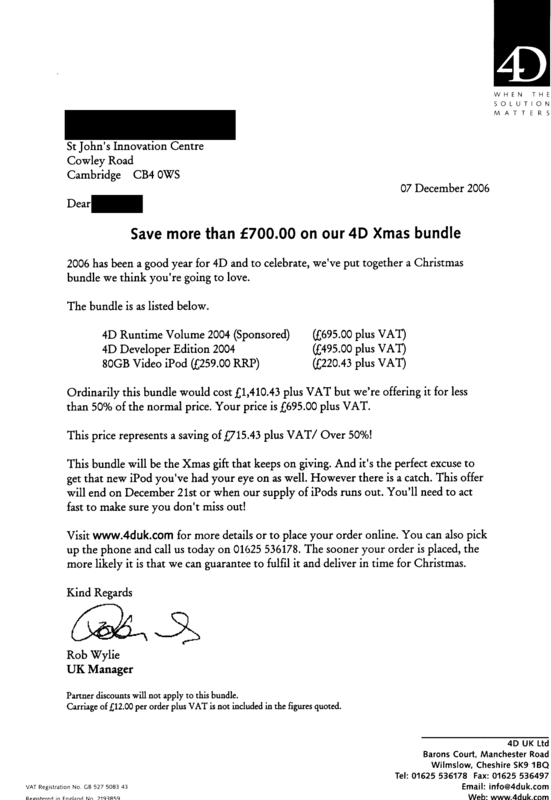 4D clearly know that I'm a business customer (in fact we've not been a customer at all since we stopped upgrading for various reasons, but there you go) so other than bribery what possible motive can they have for offering me a bundle including a Video iPod? Is there something in that specific letter that makes you think they "clearly know" you're a business customer? To my eye, the footnote about partner discounts clearly implies the opposite, that they've incompetently sent you what ought to be an offer for a personal customer. The only thing I can see in that letter that says "business customer" to me is the "St John's Innovation Centre" in the address, and I wouldn't have a remotely hard time believing that was done by computerised mail-merge and no human had thought to check it for obvious idiocy before it went out. If it's just that they-as-organisation have previously given other evidence of knowing you're a business customer, that's entirely different, and easily explained by an over-general mailmerge done by a half-asleep employee.